I posted this recipe some time ago when I prepared it as a side dish for a big dinner party. I remembered it the other day while I was staring at the last two potatoes that I found in my cabinet. What can you do with two potatoes? 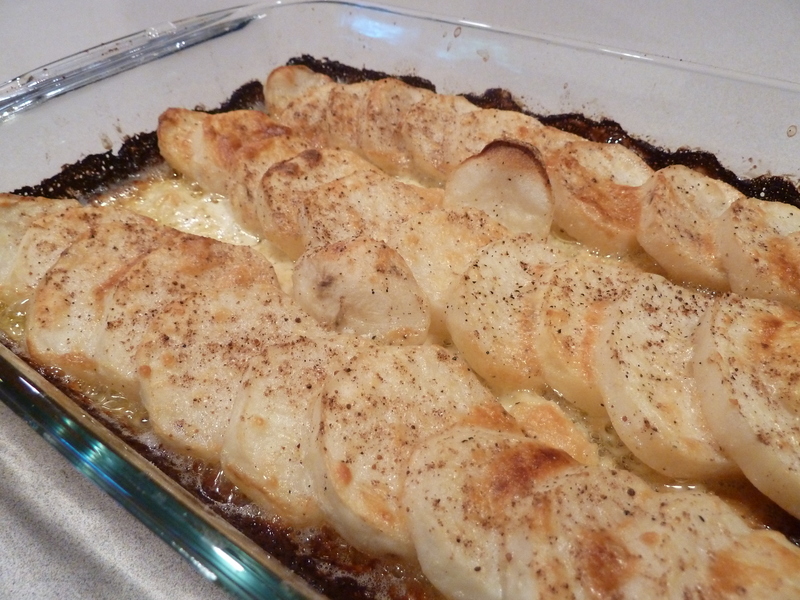 A great gratin that takes five minutes to put together and then let the oven do the job. Delicious! For the original recipe follow the link to the previous post. Here I’m posting the busy mamma version using whatever potatoes you find and substituting Gruyère with grated Parmesan. How to make: Peel them and cut them in rounds. Arrange them in a small pan, partially overlapping. Add salt and pepper. Pour heavy cream on top. Enough to see that the bottom is all covered generously but not so much that the potatoes are swimming in it. Add garlic and nutmeg. Be generous with the nutmeg. Sprinkle cheese on top and cook in pre-heated 400F /200C oven for about 45 minutes or until the potatoes brown lightly. I am so proud of my best friend, who has become an excellent cook!!! What a compliment to hear from the lips of an amazing cook! Thank you!